It is advisable to start thinking about your wedding invitations about six months before your wedding day as there are plenty of things to consider. 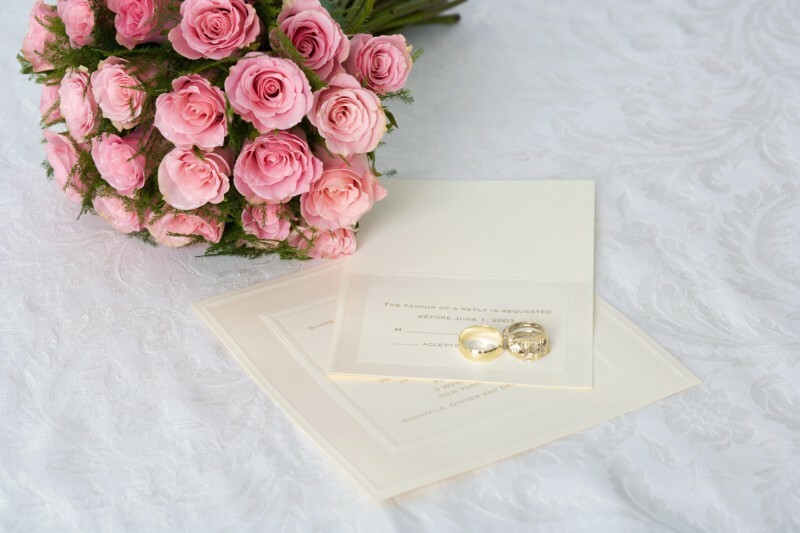 These wedding invitation tips will help to make sure you get your invitation just right. Start looking as soon as you can. If you give yourself enough time you will be able to make a more thought out decision. First consider the scale, formality, theme and budget for your wedding. Explore the variety of designs, papers, typefaces and printing methods, consider all the possibilities and choose stationery which is best suited for you and your wedding. Then include the colours of your flowers, bridesmaids dresses, and decorations to blend in with the wedding colour scheme. Your wedding invitations are the initial point of formal contact with your guests and give them all the practical details such as dates and times but they also give your guests an idea about the style of your wedding and set the tone for your special day. Bear in mind that many guests will keep your invitation as a memento of your wedding so it is important to choose carefully. You might decide to order place names, menus, orders of service, thank you cards, and a seating plan at the same time as your invites. If you decide on matching extras it is recommended you order all your stationery at the same time as this is often easier and less expensive. One complete order also guarantees that your stationery’s paper colour and weight, type face and design is uniform throughout. Typefaces or fonts are the style of lettering used for the text on the invitations and they should match the formality of the wedding without deviating too much from your own personal style. Also think about the ink colour you want to use. If you have decided on printing in silver or gold, then a plain and simple typeface will be a lot easier to read. Keep in mind you will not need an invitation for every guest as many of them will be couples and families who only require one invitation between them. Adolescents over 16, receive their own invitation separate from their parents. Consider that elderly relatives and close friends living abroad will appreciate receiving an invite, even though you may already know they won’t be able to come. Once you have counted these guests and arrived at a final sum, add another five or ten just in case. Don’t forget that the members of the wedding party still need an invite! Collect written quotes with the details of numbers, colours, paper stock and delivery date. Double check these details when placing your order. Check the product details and the amount. If your order includes printing confirm that the printing information is accurate. When you receive your sample invitation it’s important you carefully proof read it to see if everything from venue and date details to names, addresses, punctuation spacing and spelling is correct. Get someone else to check it too. 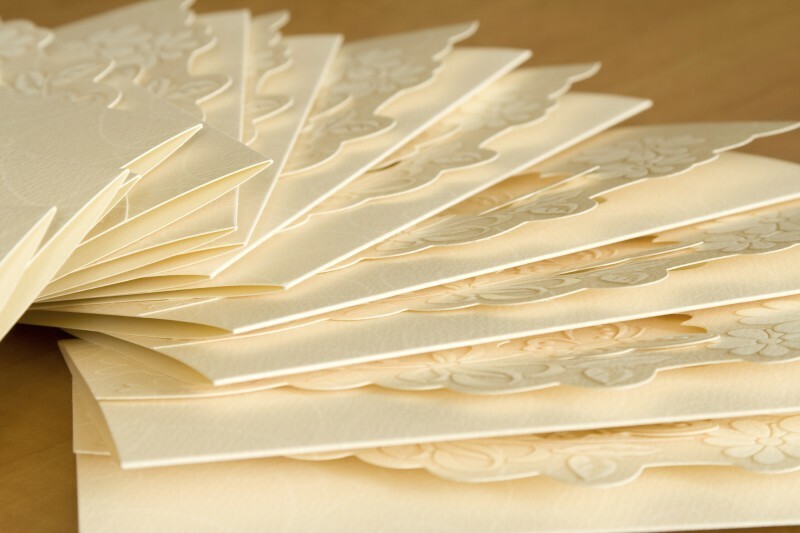 Your wedding invitations should be sent 6 weeks before your big day and it is advisable that the majority are sent out together to prevent disappointment. Send international mail 8 weeks prior to your wedding. Overseas guests and guests from other parts of the UK should have already been informed informally of the date immediately after it has been set to enable them to make travel arrangements. Your RSVP date should be set at least three weeks prior to your wedding date. You can send out additional invites if you get any replies stating they cannot attend.